HiComm magazine started in year 2001, when the mobile communications were young and modern technology, and also a projection of the most advanced people’s desire to know more about the world and to connect with each other. 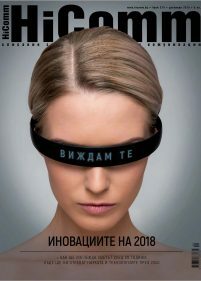 Nowadays it is the biggest, most popular and most trusted tech magazine in Bulgaria, with 100% original editorial content. During the years the magazine developed a unique, rich and flexible editorial formula based on the fact that those who are interested in modern mobile technology are interested in technology itself – in its both practical and inspirational side. So we cover a wide scope of topics like mobile communications, mobile devices, home entertainment, photography, computers, hi-tech cars, scientific researches and future concepts, games and movies – basically all intersection points of modern technology with the human spirit of high achievements. We also pay attention to the way all of these devices and technologies change the way we live, work and play. Those trends are reflected both in our content, and in the way we communicate with our audience. Following them, we are constantly changing and developing our multiplatform and multichannel media portfolio including dynamic and rich in content web site, very successful email newsletter, and our special monthly pocket edition SmartApps, focused on mobile application and top mobile devices, with free distribution. The bi-directional communication with our audience is in the core of our media model, so we developed an initiative and a platform to listen to people’s opinion by organizing online voting for the best products and content of the year. It helps us to receive highly valuable feedback from end users and to become even more confident in participating in the EISA Mobile Devices Expert Group we are extremely happy to be part of.